The third edition of Adharva is to be conducted on 27 and 28 April 2019. The logo for Adharva ’19 was released on 19th March 2019 and was an instant hit. Adharva is the Techno-Cultural fest of the Department of Electronics and Communication Engineering. 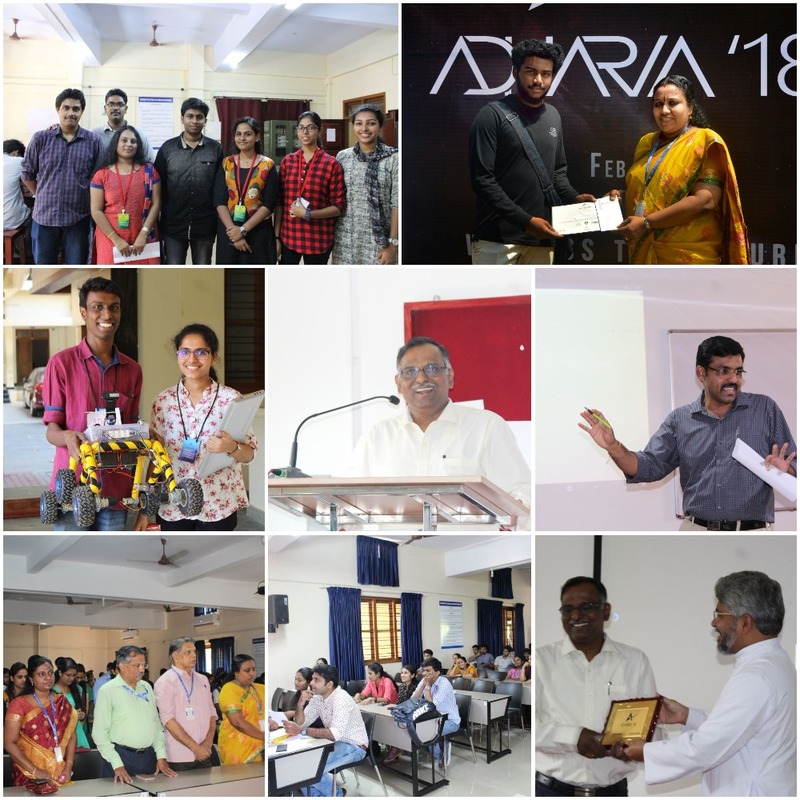 The second edition of Adharva was conducted on 24th February 2018. The logo for Adharva ’18 was released online on 10th February 2018 and was an instant hit. The promo video was released on 21st February 2018 and received critical acclaim. Adharva is the Techno-Cultural fest of ECE Dept. of MBCET. The inauguration ceremony of Adharva’18 was presided over by Dr V. Narayanan, Director LPSC ,ISRO TVPM. This year Adharva consisted of over 15 events. Flash fiction ,Musical.ly and Photography events were conducted online and the entries were invited till 23rd of February, 2018. The main events held in college were JAM, Debate, Expo, Blago Run, Q’riosity (School and College level Quiz), Circuit Debugging, Eureka, Matlab Coding, RUSH, Junkyard Wars and The Perfect Ambassador. This time over 200 participants registered and participated for Adharva and this is a testament to the hardwork of the core team and the faculty of the ECE Dept. The fest was made lively through various fun Informals like #Be Kiduve, Gaming to name a few. The fest blazed its way to a glorious finish providing both participants and hosts with the sense of meritorious satisfaction and leaving them with an assurance of greater things to come. The project proposal on the topic “Interface for hearing impaired and talking disability with normal people”submitted to CeDS by Abishek V., Don Jose and Jude Thomas P. Boben under the guidance of Ms. Deepa P. L. is approved by the committee. Ms. Priyadarshini G, Ms. Shruti Prasad, Ms. Leia J Thomas and Ms. Neha Mariam Varghese (S4 EC2) won first position in INVENTO, a product development competition held at LBS Institute of Tehnology for Women on 27th February, 2016. As a part of internship, the S7 EC students visited the following industries: Trivandrum airport, Cochin airport Keltron, Doordarshan, BSNL, Railway , All India Radio , Datamatics global, Igatech, Kakkanad, Gateway Terminal Pvt. Ltd..
As a part of internship, the S3 EC students visited the following industries: All India Radio, State Crime Records Bureau, Keltron, Emvigo, Suparnika Builders, CET (Bosch), BSNL, Doordarshan Kendra, Prasar Bharathy, Regional Telecom Training Centre. New LED Message display panel work is in progress and is handled by the ECE students Naveen S, Abhinand S, Don Jose, Abhishek V, Sreehari and other students. Chosen for Texas Instruments Innovation Challange India Design Contest 2015 and won the 2015 Malayala Manorama Yuva Mastermind Prof. Sathish John Memorial Award held at JDT Islam Convention Centre Calicut. Mr Joji John Varghese was chosen to visit the National University of Singapore (NUS). Won the first prize in the Marian Award for Technology Excellence (MATE) 2015, held at Marian Engineering College, August 17, 2015. The project titled “Neosense” by Joshua K Mathew (EC), Kavya (CS), Vivek (CE) and Reshmi (EEE) was chosen for final round of TechTop 2014 project competition and won second prize. The project titled “LIOT, Internet of Things with Light Fidelity” by Joshua K Mathew (EC), Vivek Joy (CE), Kavya Suresh (CS), Reshmy Prasad (EE) and Akhil R (CS) was chosen for Texas Instruments Innovation Challange India Design Contest 2015 and qualified for the Quarter finals. The project titled “VISTHAARA, A Scalable Home Automation System” by Nibin Peter (CS), Sathyajith S L (CS), Kiran Mathew Mohan (CS), Alex Mathew (CS) and Sachin S Daniel (EC) was chosen for Texas Instruments Innovation Challange India Design Contest 2015 and qualified for the Quarter finals. The project titled “EEG Based driver Alert System” by Vineeth G.K. (EC), Athul Prasad C.V (EC) and Joji S.Pramod (EC) was chosen for Manorama Yuva Mastermind 2015 project competition. The project titled “Smart Wearable Device” by Joji John Varghese (EC) was chosen for final round of TechTop 2014 project competition, Manorama Yuva Mastermind 2014 project competition and won prize in the Electronics for You Design Contest. Ms. Jijina N. secured 1st rank for M. Tech in Telecommunication Engineering from University of Kerala. Ms Lani Rachel Mathew and Ms Rinju Mariam Rolly secured 2nd ranks and Mr Jithu Vimal secured 3rd rank for M. Tech in Telecommunication Engineering from University of Kerala. The project “Robotic Arm for the disabled”, by Sanju Mathew, Saan Joa Rughas, Anjana Anandan, Parvathy G and Mamatha Raj, of eighth semester Electronics and Communication Engineering, was the runner up in Yuva Mastermind programme conducted by Manorama 2011 in association with Amal Jyothi College of Engineering, Kanjirappalli and got first prize in Silver Ribbon, an event of the technical and cultural fest “Fugeniz” of Sree Narayana Gurukulam College of Engineering, Ernakulam. The prize distribution function is on August 2011. Ms. Gopika Sreekumar (S8 EC) got third prize in English debate 2016. Mr. Deepak John Reji (S8 EC1) and Mr. Sajith R (S6 EC1) were chosen as the Arts Secretary and General Secretary of the College Senate respectively. Ms Mariya Roniya, Ms Athira Krishnan R, Ms Swati Chandran and Ms Aishwarya Krishnan of S7 EC1 won the 2nd prize for Group Dance in the Kerala University Youth Festival, 2015. Ms Mariya Roniya, Ms Athira Krishnan R, and Ms Aishwarya Krishnan (S8 EC1) won the 1st prize for Thiruvathira in the Kerala University Youth Festival, 2015. Ms Reshma S S and Ms Mariya Roniya (S8 EC1) won the 3rd prize for Kathakali in the Kerala University Youth Festival, 2015. Ms Athira Krishnan R (S8 EC1) won the 2nd prize for Bharathanatyam and 3rd prize for Kuchipudi in the All Kerala BSNL Cultural Meet, 2015. The Electronics Association is very active with the full participation of the students of all Semesters. Invited lectures by experts drawn from industries and academic field are arranged regularly. The students are encouraged to present papers on current topics. This has helped the students to improve their communication skills and update their technical knowledge. Programs like quizzes, group discussions, and talks are conducted by ENIX. The association also has a social service wing ‘Spandanam’. 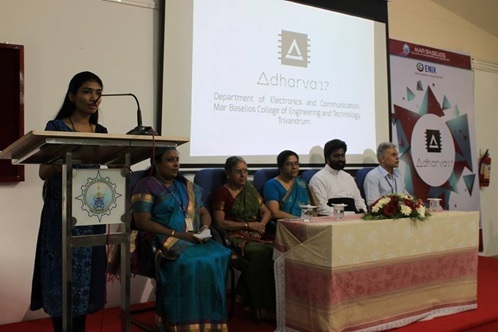 The Association of Electronics and Communication Department (eNIX) of MBCET, for the very first time came out with their Technical Fest: Adharva’17. The Technical Fest started off with the curtain raiser event on 8thMarch, followed by a talk on Machine Learning by two of our alumni Mr. Pranoy and Mr. Abhiram H. on March 17th,2017. The event was inaugurated by Dr. Rajasree M.S., Director, IITM-K on March 18th, 2017. Both managerial and technical events were charted for the Technical Fest. The Fest was coordinated by Ms. Sreedevi P. and Mr. Aravind Prem. Managerial events like flash fiction and photography portrayed the diverse shades of city life in Trivandrum and the event Perfect Ambassador enabled the students to think out of the box. Technical events like Paper presentation, Exhibition, Junkyard wars, RC racing and Quiz enabled the students to explore the engineers in them. Participants from various colleges in South India took part in this event. ENIX releases a newsletter named E-WAVE, a collection of articles written by the staff and students which explores the recent trends in technical world and provide a platform for students and staff to foster their talents for writing articles, both technical and non technical.